Gordon James, Principal Horn of the Huntsville Symphony Orchestra, has been playing and teaching Horn for over 30 years. Gordon is presently the Principal Horn of the Chattanooga Symphony and Opera. He has been a member of the CSO since 1987. Prior to that, Gordon played 4th Horn in the Fort Worth Symphony for 5 years. He has also performed with the Alabama Symphony, the Dallas Symphony, and the Baltimore Symphony. 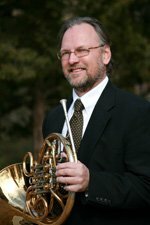 Gordon is presently the Adjunct Horn Instructor at the University of Tennessee at Chattanooga, Lee University, Southern Adventist University, and Covenant College. He received Music Performance degrees from the Peabody Conservatory of Music, and the University of North Texas. Gordon has attended Roundtop (TX) Music Festival, and the Grand Teton Music Festival. In his spare time, Gordon enjoys driving and maintaining antique cars, and he’s an avid DiscGolfer.